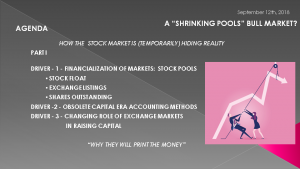 IN-DEPTH: TRANSCRIPTION – A “SHRINKING POOLS” BULL MARKET? IN-DEPTH: TRANSCRIPTION - A “SHRINKING POOLS” BULL MARKET? 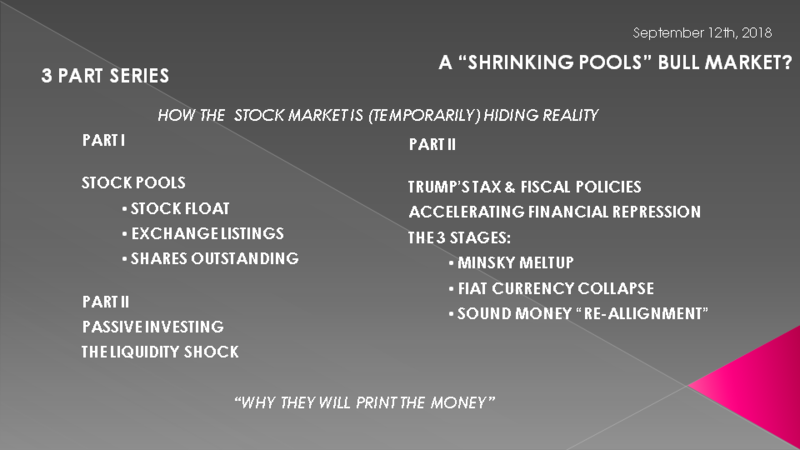 Today we are going to initiate a three part series on how the stock market is at least temporarily hiding economic reality and why the powers "to be" can be counted on to print the money. We will expand on some foundation work in Part 1 & 2, which we have discussed to some degree previously, before moving to the three unfolding stages we see ahead over the next few years. 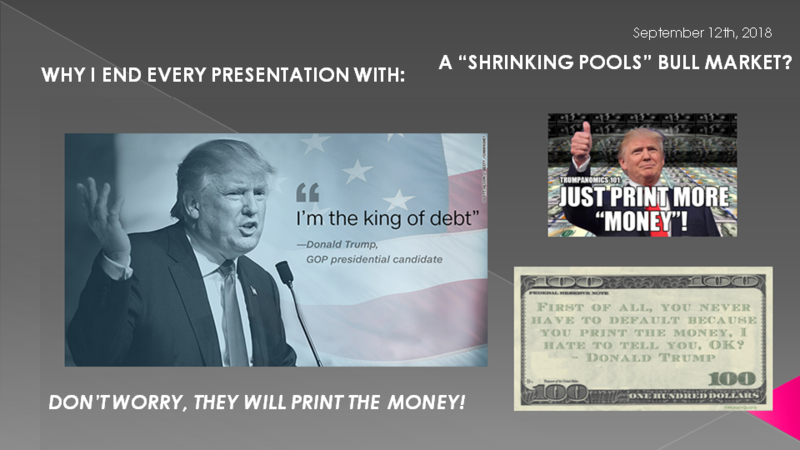 As you are only too well aware I have been ending these monthly video's with this slide for a very long time now. What I hope to achieve in this three part series is answer why this will happen (via the facts) as opposed to simply an educated opinion. I believe the central bankers of the world are now trapped and will be forced to play out an already scripted series of policy initiatives. 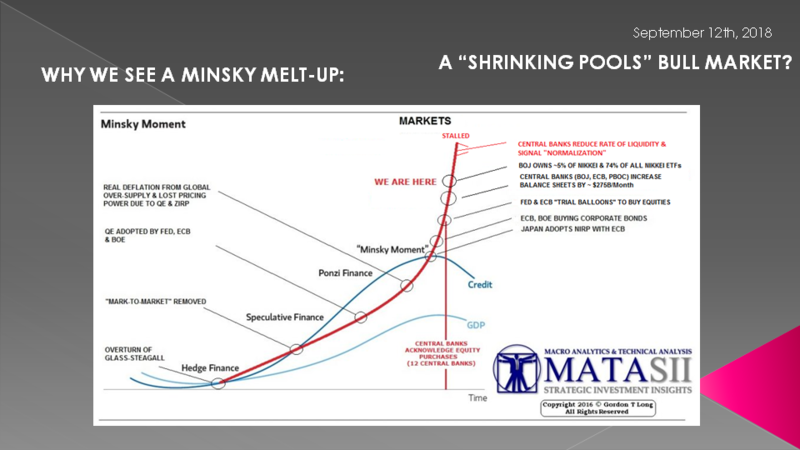 I also hope to show in the concluding Part III why a Minsky Melt-up will occur as part of three unfolding stages. 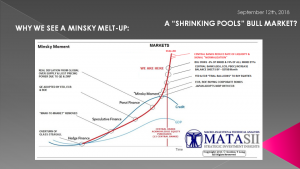 We are already in Stage I as the Minsky Melt-Up is now underway. What I am sure is surprising to many, is it is still in its' early stages. 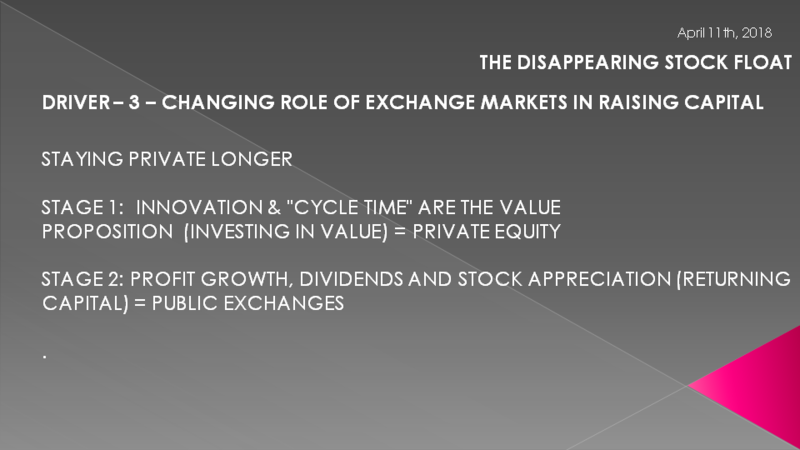 The Changing Role of Equity Exchange Markets as the traditional way of raising public capital. All of which are resulting in elevated equity markets. The Actual number of Outstanding Issued shares currently being reduced by the massive Buyback phenomenon. We discussed the changes in the stock float pool earlier this year in a prior LONGWave video. I encourage you to revisit it in our Macro Analytics library. 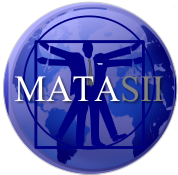 For those that our new subscribers or missed it I will briefly summarize its key messages. 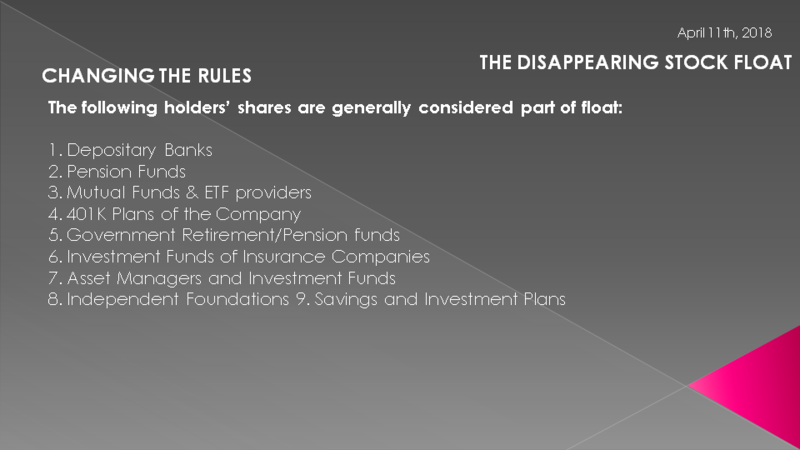 The market Float is the number of shares actually available for trading. 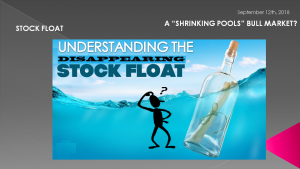 Float is calculated by subtracting the closely held shares -- owned by insiders, employees, the company's Employee Stock Ownership Plan or other major long-term shareholders -- from the total shares outstanding. The Float can be difficult to determine and therefore requires and depends on definitions. The public is unaware of how this is determined and generally have to pay service providers for this information. 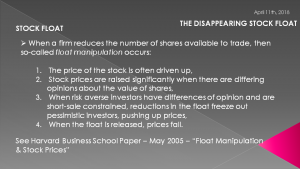 When a firm reduces the number of shares available to trade, then so-called float manipulation can occur. When the float is released, prices fall. 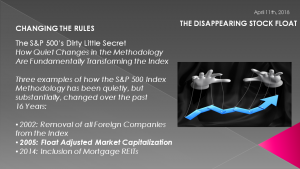 In actual fact this is part of the S&P 500’s 'Dirty Little Secrets" and how quiet changes in the methodology have fundamentally transforming the index. All are interesting changes but we are only focusing on one today. 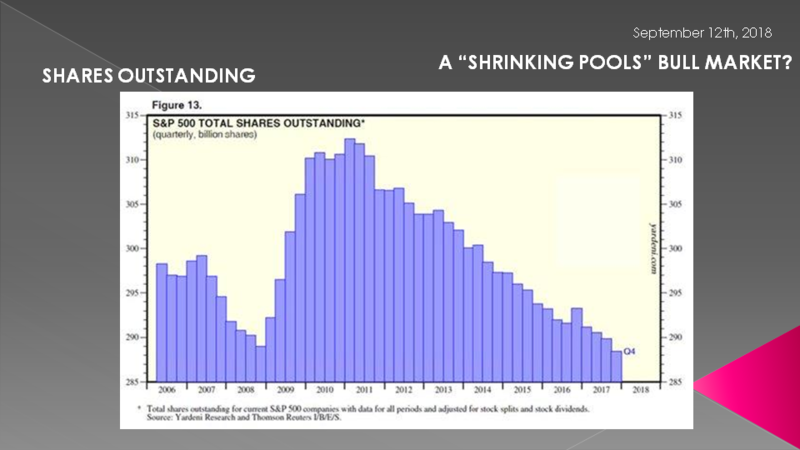 Since 2005, S&P 500 has been float weighted. 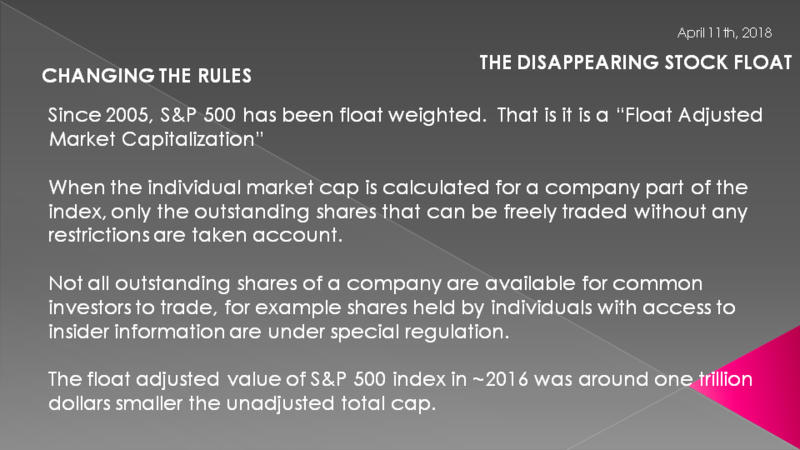 That is it is a “Float Adjusted Market Capitalization” Index. What does that mean? 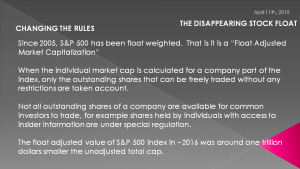 When the individual market cap is calculated for a company part of the index, only the outstanding shares that can be freely traded without any restrictions are taken into account. To put all this in perspective, the float adjusted value of S&P 500 index in 2016 was around one trillion dollars smaller than the un-adjusted total capitalization. A research report from Horizon Kinetics (PDF) uses Microsoft as an illustration. Had these rules been in effect during the 1990’s, what would it have done for index fund investors? When added to the S&P 500, the share price was about $2.41. At January 1999, when the stock was $44.75, insiders still owned 31% of the shares. 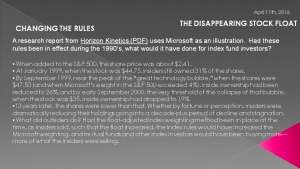 By September 1999, near the peak of the “great technology bubble,” when the shares were $47.50 (and when Microsoft’s weight in the S&P 500 exceeded 4%), inside ownership had been reduced to 26%, and by early September 2000, the very threshold of the collapse of that bubble, when the stock was $35, inside ownership had dropped to 19%. 13 years later, the shares were lower than that. 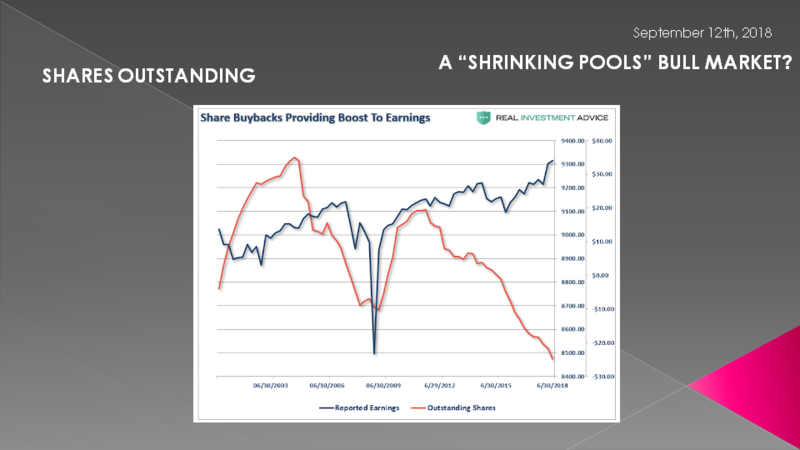 Whether by fortune or perception, insiders were dramatically reducing their holdings going into a decade-plus period of decline and stagnation. What did outsiders do? 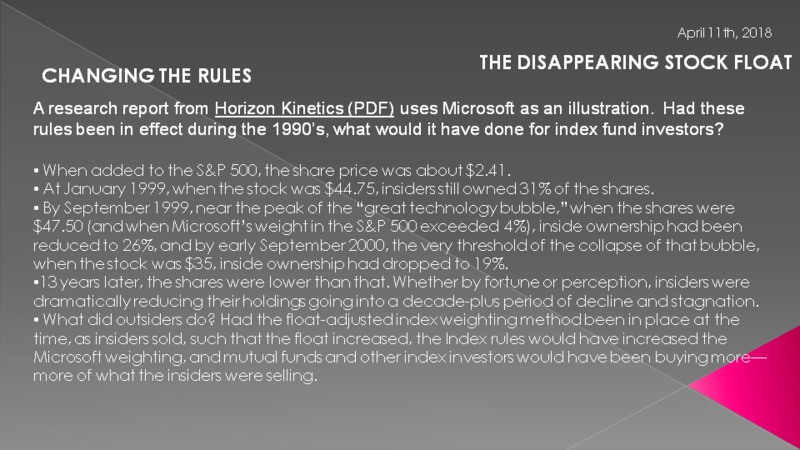 Had the float-adjusted index weighting method been in place at the time, as insiders sold, such that the float increased, the Index rules would have increased the Microsoft weighting, and mutual funds and other index investors would have been buying more—more of what the insiders were selling. 11. Any individual person listed as a 5% or greater stakeholder in a company as reported in regulatory filings (a 5% threshold is used as detailed information on holders and their relationship to the company is generally not available). In other words the actual float available to trade is shrinking dramatically. 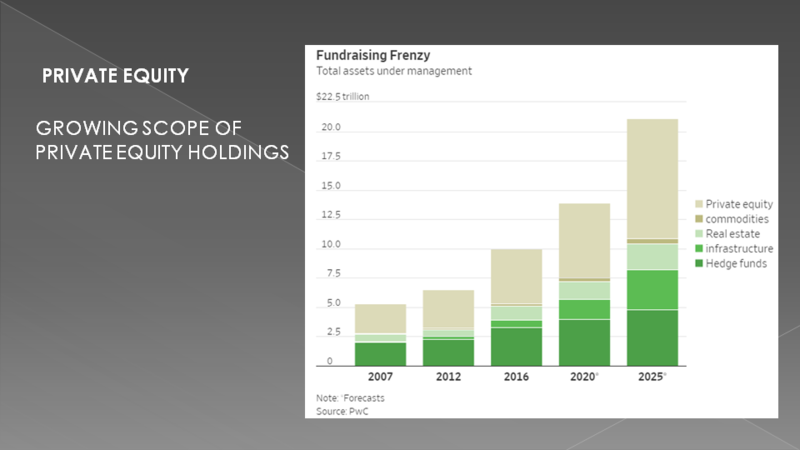 As we will discuss in a moment Private Equity purchases are having a profound impact on the public available float. But it gets worse - much, much worse!! The shrinking numbers of share listings & the shrinking volumes outstanding stock is ALSO shrinking!! The phenomenon we are witnessing in this regard is both unprecedented and fascinating. Stocks are vanishing before our very eyes. 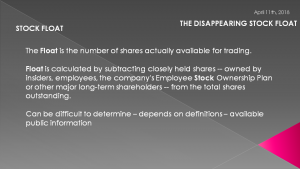 Stocks are disappearing at an alarming rate. 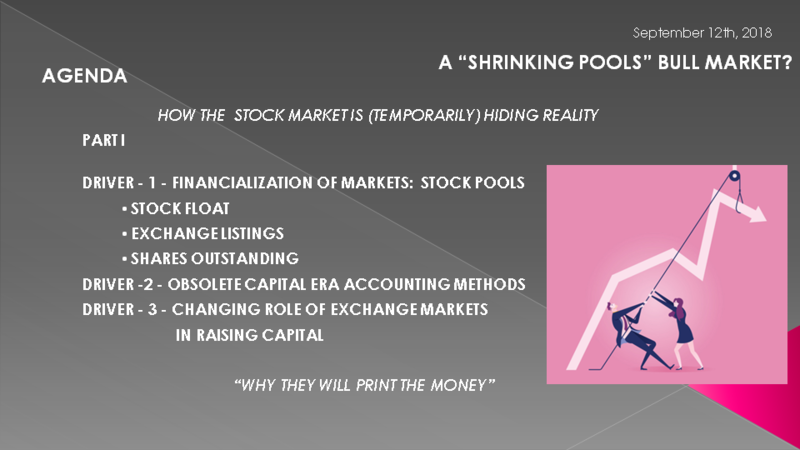 At the current rate of stock vaporization, the average large capitalization growth stocks according to work by Louis Navellier will disappear in approximately 17 years. If that sounds crazy, check this; The entire S&P 500 will disappear in 27+ years! 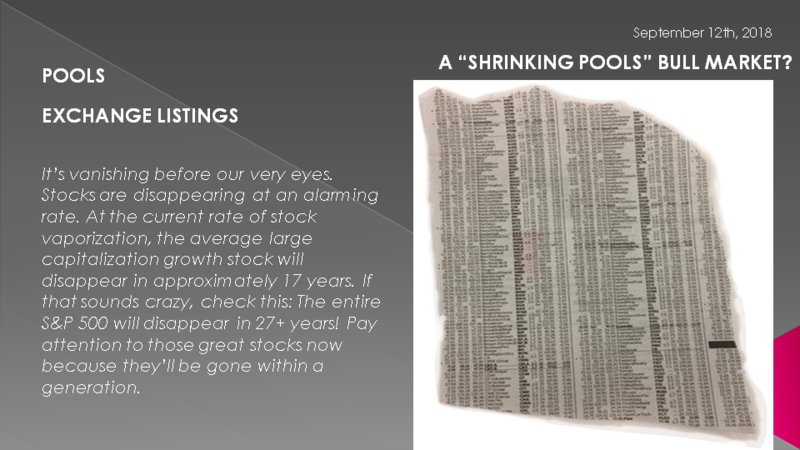 You may want to pay attention to those great stocks now because they’ll be gone within a generation. Stock markets have in recent years been shrinking (by listings but not by market cap). 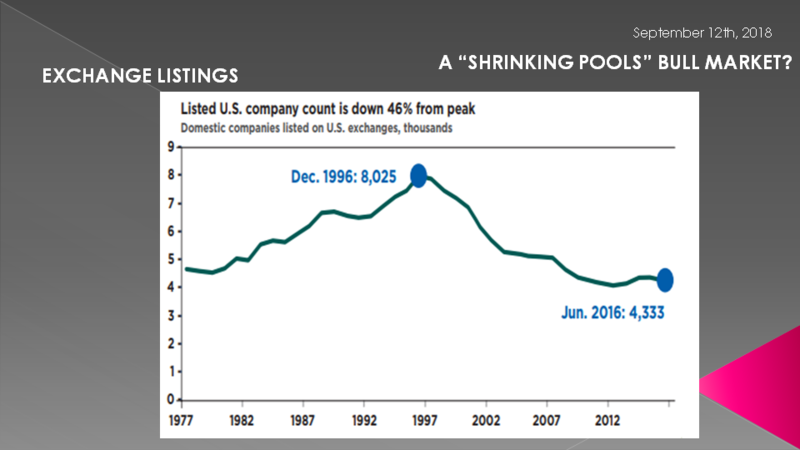 There are fewer firms listed on U.S. exchanges than 40 years ago. In 1976, the United States had 4,943 firms listed on exchanges. 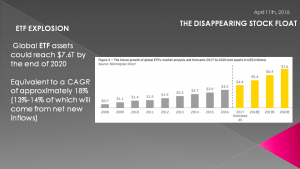 By 2016, it had only 3,627 firms. From 1976 to 2016 the number of exchange-listed firms has dropped by 27 percent. In Germany for example the number of listed firms fell by 41 percent during the past decade alone , to only 450. Listings are growing only in China and other parts of Asia which converted to capitalism only recently. 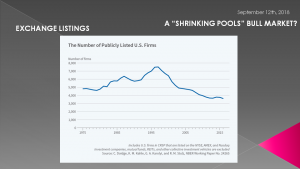 The number of publicly traded companies on the major U.S. stock exchanges has been cut nearly in half between the end of 1996 and 2016. More buyouts by private equity. Also many companies are going “all the way” into oblivion by buying up all of their shares over time, "Going Private" or "Dark". 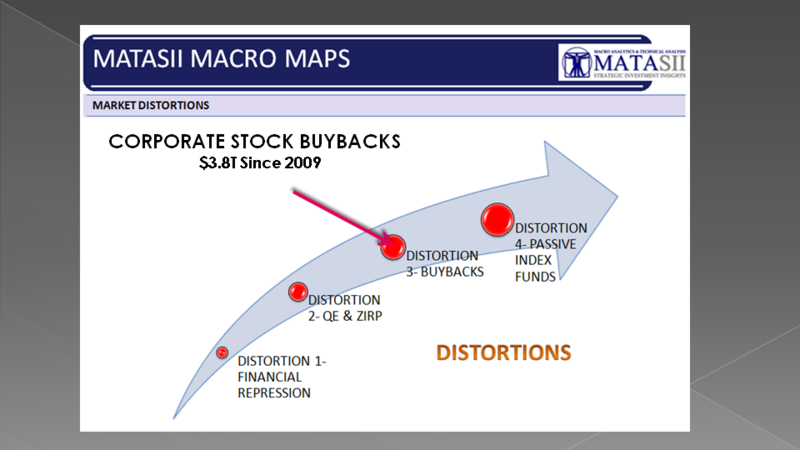 … however the Big Kahuna is Buybacks or the actual reduction of shares outstanding by major public traded entities. 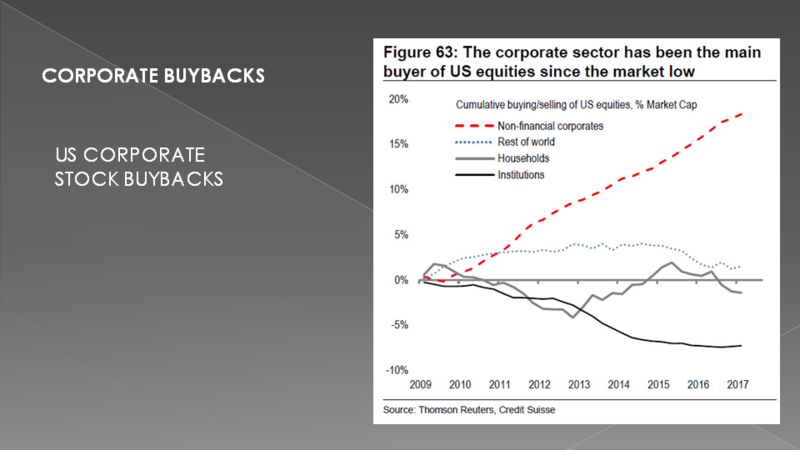 As big as $3.5T in buybacks has meant over the last 5 1/2 years, it is only getting larger. 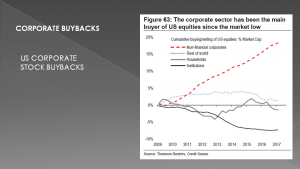 Trump's Tax rate decrease have now meant even high rates of buybacks in 2018. Companies are expected to authorize more than $1 trillion in share buybacks for 2018, according to Goldman Sachs projections. 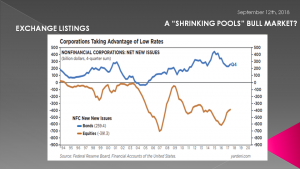 Low interest rates spur corporate borrowing through debt issuance. They take the money and buyback shares. Tax reform is allowing a massive repatriation of foreign money to come back home. Corporations are taking the money and buying back shares. As the outstanding float goes down, share prices go up. 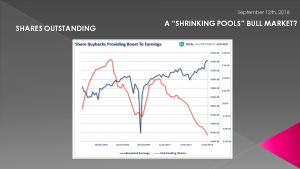 This chart shows the incredible shrinking stock market best of all. 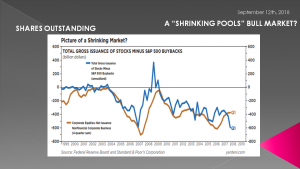 We can see that the gross issuance of new stock is rapidly decreasing. The number of outstanding shares is dwindling. The stock market is slowly vanishing. It’s dying in front of our very eyes. 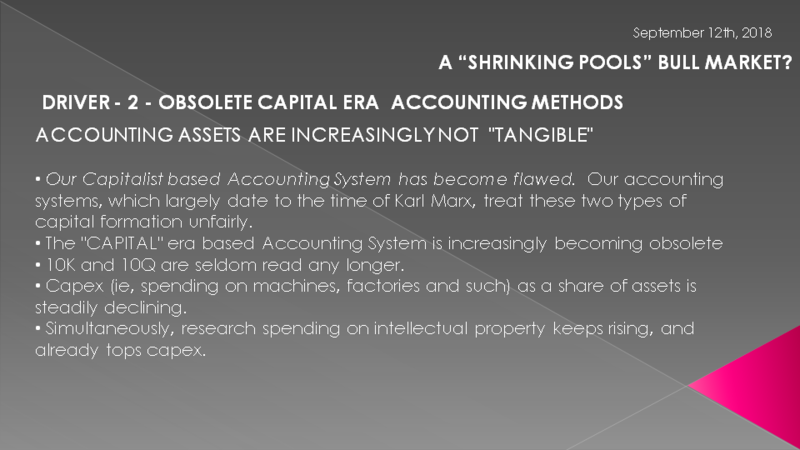 ACCOUNTING ASSETS ARE INCREASINGLY NOT "TANGIBLE"
Our Capitalist based Accounting System has become flawed. 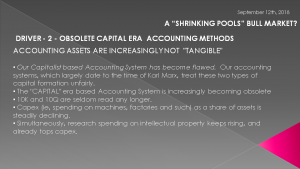 Our accounting systems, which largely date to the time of Karl Marx, treat these two types of capital formation unfairly. 10K and 10Q are seldom read any longer. 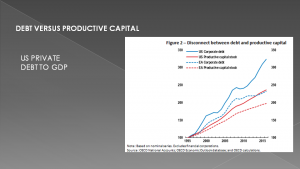 Capex (ie, spending on machines, factories and such) as a share of assets is steadily declining. Simultaneously, research spending on intellectual property keeps rising, and already tops capex. A firm that spends €1 million on R&D must record this as an expense, thus probably (if it is a start-up) wiping out earnings, even if it has just found the Next Big Thing in its lab. 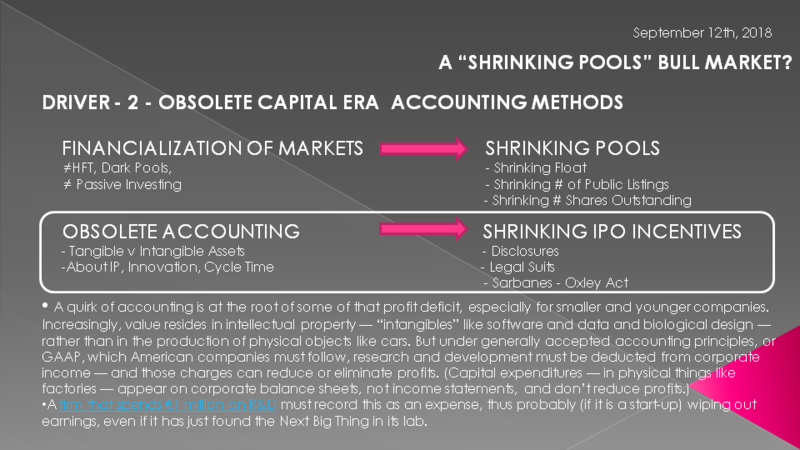 Official profits are thus becoming almost irrelevant, while for company founders, they seem increasingly misleading. If managers tell the markets too little about their patents, their firms will be undervalued; if they tell too much, rivals will know their secrets. Better to just find private equity and be done with it. Our visibility into the inner workings of public companies isn’t great, but we know far more about them than we do private companies, which aren’t required to disclose nearly as much information. And these changing dynamics mean we know far less about many of the creators of American profits and jobs than would otherwise be the case. 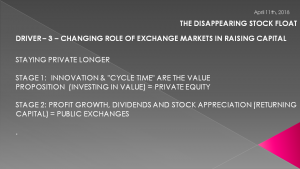 What we also need to appreciate is that the role of exchange traded markets is changing from primarily being about raising capital to being a payout machine to investors in the form of buybacks and dividends. Capital being raised differently, it is being raised through debt and by different players. Without deep knowledge of a company’s critical research — which businesses may be reluctant to share, for competitive reasons — it’s difficult for outsiders to evaluate a start-up’s worth. That makes it harder to obtain funding, and it may be partly responsible for certain trends: why there are fewer initial public offerings these days, why smaller companies are being swallowed by the giants, and why so many companies remain private for longer. Profits in the overall market are now divided among fewer winners. 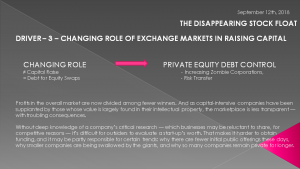 And as capital-intensive companies have been supplanted by those whose value is largely found in their intellectual property, the marketplace is less transparent — with troubling consequences. That creates opportunities for private equity firms, which have insider access to innovative start-ups that may never go directly to the public markets. Meanwhile, Main Street investors are consigned to a less diverse universe than they may realize. 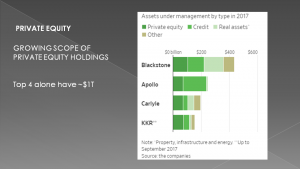 The top four US PE firms had over $1T in assets alone. This is up dramatically in the last 10 years. Shown here in tan you can see that the growth is going exponentially! Investors are clamoring to get in! What is their strategy? One thing we do know is they TRADITIONALLY don't start new companies but rather buy existing public companies, leverage them up with debt, merger them or other strategies that are stock price oriented. 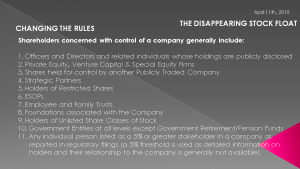 Recall, that their shares are those removed from the float - of course until they are sold. Meanwhile as they hold them and their stock goes up they have more collateral with which to increase total buying leverage. It must be a wonderful ride for them!! Private Equity is notorious with loading up debt on takeovers. Things have progressed further in my view. Today they don't need to have total equity control but rather just board room control. Board positions can come from being major debt holders or arrangers of debt versus simply their equity position holdings. 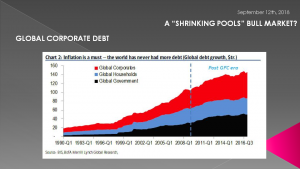 As we have discussed in our recent Zombie Corporation videos, the problem of debt payment levels versus cash flow and profits is becoming a global issue. Fed appreciate the role PE is playing in this shift. 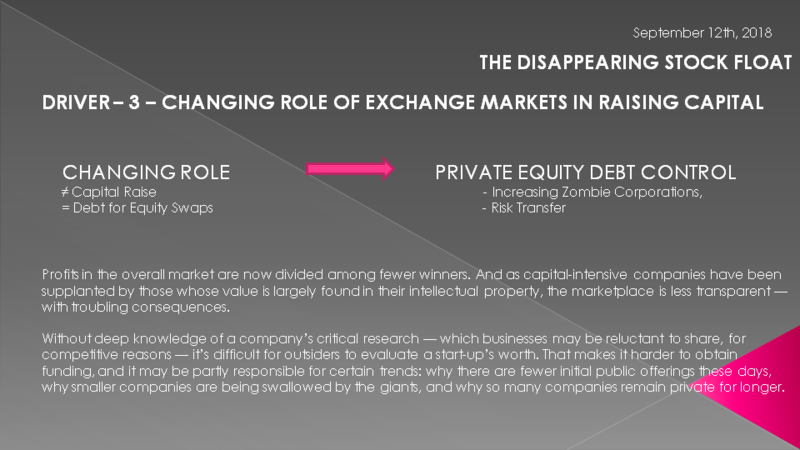 Whether Zombie corporations or "Challenged" firms the number are once again worrying! 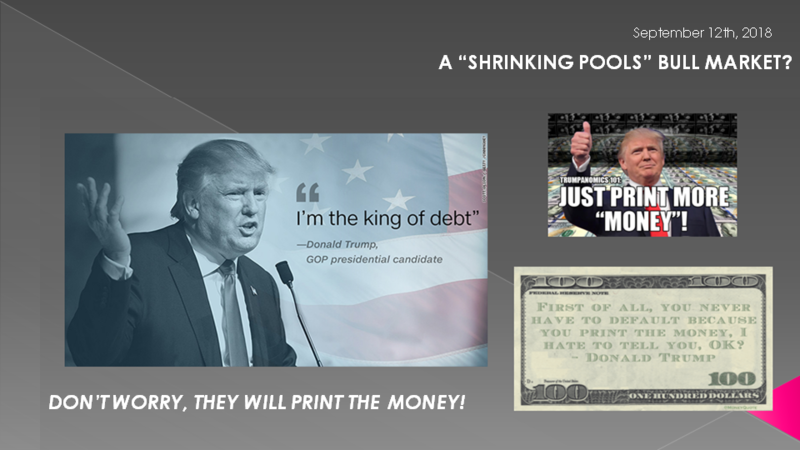 Clearly the disconnect between their debt and productive capital stock doesn't bode well for the future. Debt issuance has actually been growing. 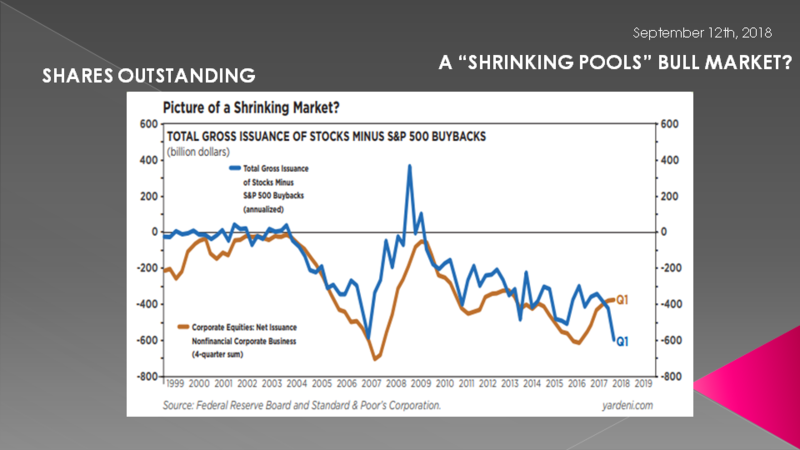 Companies are issuing debt to help facilitate buying back more stock. This would mean outstanding stock is shrinking. That’s precisely what this chart shows. What is going on is something we projected many years. A massive Debt for Equity swap. 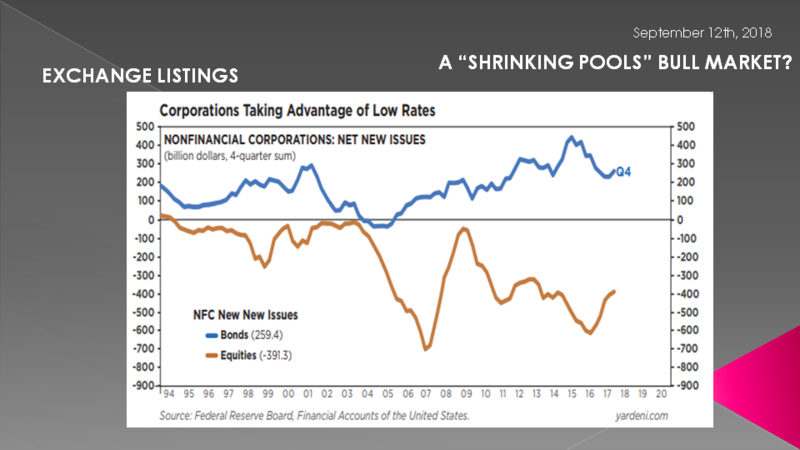 Corporations are swapping debt for their equity. The debt holders are becoming controllers of companies. If and when stocks fall, equity holders may get wiped out but debt holders will be paid -unless the company goes bankrupt. Then the debt holders only squabble over the asset divison. 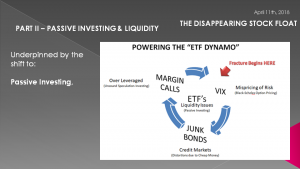 In part 2 we will discuss the distortions and problems associated with Passive Investing. The growth of ETF Index trading has grown dramatically as have the issues associated with it. 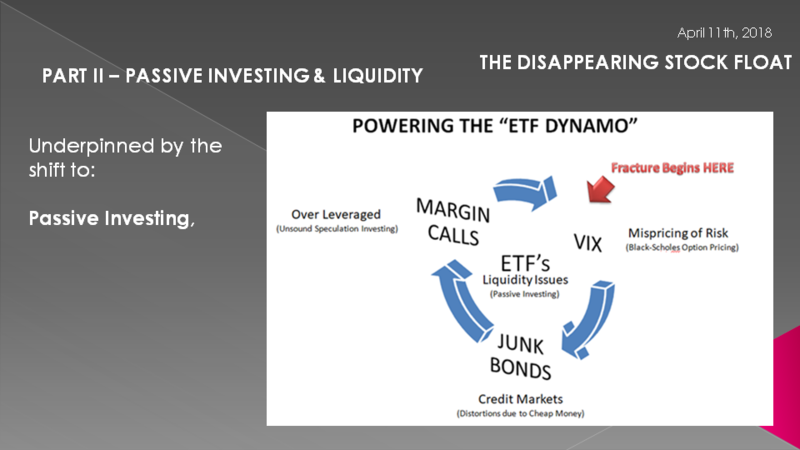 I have mentioned numerous time my concerns with the ETF Dynamo. We will discuss it further in the context of what we have just discussed. 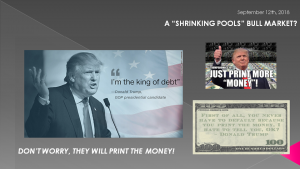 As I often remind our listeners, remember they will print the money to solve any and all problems until such time as no one will take the money or it is of no value. That day is still in the future so take advantage of the opportunities as they currently exist. 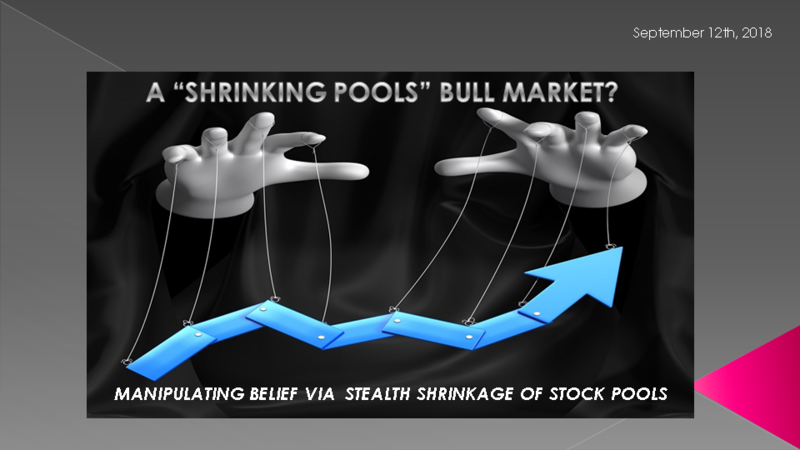 Investing is always easier when you know with relative certainty how the powers to be will react. Your chances of success go up dramatically. 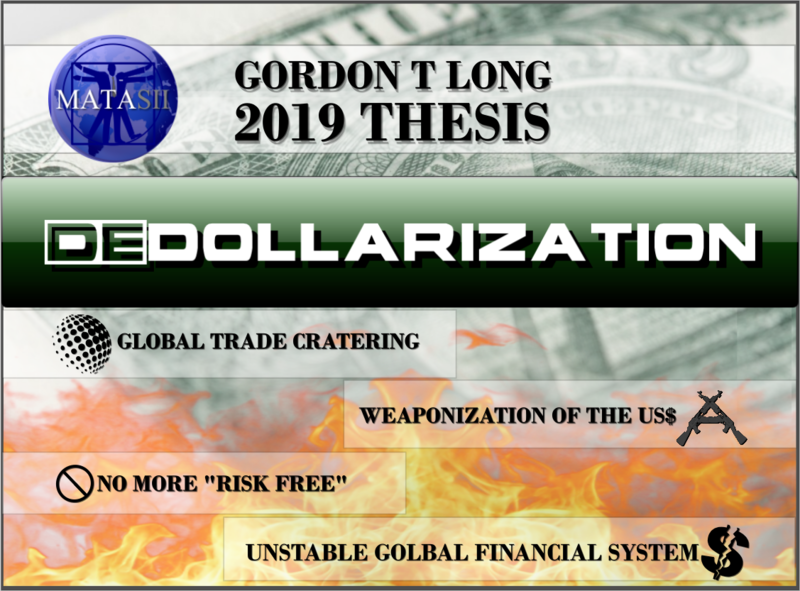 The powers to be are effectively now trapped by policies of unsound money and fiat currencies. DO NO NOT TRADE FROM ANY OF THESE SLIDES - they are for educational and discussions purposes ONLY. Thank you for listening and until next month may 2018 be an outstanding investment year for you and your family.